Composer based character on woman who has lived on Glendale streets for years. His interaction with Antonia Listo would serve as an inspiration for the main character in his rock opera, "Visions -Words ofWisdom" - which opened Friday in Los Angeles. Listo has been a fixture of the Glendale streets for about 15 years. The details are hazy, but she tells those near to her that she lost her job, her husband and her home in quick succession. 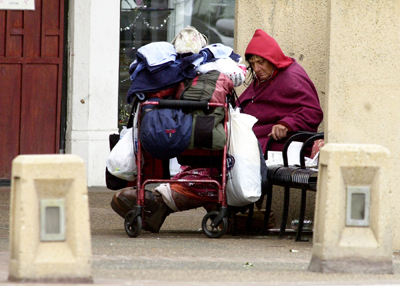 She's not homeless, she stresses, just in search of affordable housing. "I spent $89 for a hotel room one night because they raised their rates around New Year's," she said. "I just have welfare, once a month. I need a [Section 8 housing] certificate but when I get it, I can't find an apartment. You need somebody with a car to drive you." In the meantime, people like Papakostas stop and lend a hand. One night, Listo sat huddled under a blanket on a bench at the corner of California Avenue and Brand Boulevard as Papakostas tried to find someone to help him keep her company through the night. "It's freezing, I'm 70 years old, I can't stay out here," she said. "I want to lay down and go to sleep." Then she turned toward Papakostas: "I want you to get me a motel room. It's freezing and I can't stay on the streets." She can barely walk due to kidney problems, and Papakostas often takes her boots off and puts talc and medicine on her feet and ankles. It would take her an hour to walk to Kinko's, less than a block away. "I take care of myself," she added. "When I get an apartment, I'll get help for my legs." Passersby frequently stop to ask why she isn't at the shelter. The answer is simple, Listo replies: "There are two flights of stairs [to get to the bathroom] and I can't climb them." "We've run out of options," Papakostas said. One day about five years ago, Papakostas stopped by to see her, as had become his custom. She told him her Bible had been stolen; he was surprised she had a Bible at all. "I said, After everything that has happened, living on the streets, you still believe in God?"' She replied that she still went to church weekly, and that's when the idea for the rock-opera character was born, he said. The central figure ties together what the composer - who uses the stage name Dimitris -calls "the most spiritual journey" of his life. "Visions -Words of Wisdom" features a homeless woman sent to save the soul of a young stock market executive. Tired and broken by her life on the streets, she has nothing to convince him life can be more fulfilling except for her visions of the great leaders of the past, including the Buddha, Mother Teresa, Jesus Christ and Gandhi. "You have good and evil fighting over these two," he said. "If this homeless person changes her life around, then both people are going to go to the good." The play ends with the woman's death, and all her homeless friends sing a tribute to her as she rises to the heavens. Papakostas said he is trying to carve off $1,000 from the musical's budget to fund hotel rooms for Antonia. I've learned how to be happy with everything I have and don’t have. I've learned not to ask for much. I've learned how to give with no return. I've learned that every time you give with no return, the Universe gives you back. I've learned to always look ahead. And when you've learned all that, you are ready to move on and taste eternity as she did. My homeless friend, my good friend, Antonia.